The two sides discussed ways of joint cooperation with the parent company, which represents the Chamber of Industry and Commerce of Istanbul, and a group of Turkish universities. The guest concluded his visit with a tour in the campus introducing to him the programs offered by the university in PhD, MA and BA degrees. 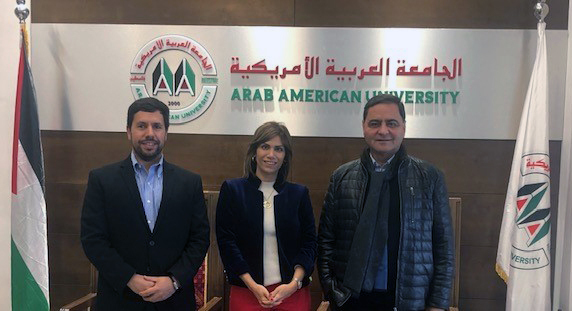 Furthermore, Dr. Dalal Erekat also welcomed the Palestinian businessmen Sameer Halilah and Mohammed Al-Khatib, who visited the University campus in Ramallah as they were also introduced to its academic programs and services provided to the local community. they praised the role of the private sector in higher education and expressed their pride in the university as a scientific edifice meeting the market requirements. As they praised the quality programs offered by the university, and the role of Palestinian businessmen who invest their money to serve the nation through educational process, especially at the postgraduate level.